Every kitchen remodel needs that special element that makes it stand apart while creating functionality. The countertop is the perfect component to catch eyes, add to the design, and be useful all at the same time. These days, the amount of countertop materials available and special features you can add are only limited by your imagination. Here are some ideas on how you can bring your countertops into 2016. For a more modern and unique look, concrete is a great countertop material. It can be made in a variety of colors, is stain resistant when sealed, and can be cast in any shape. 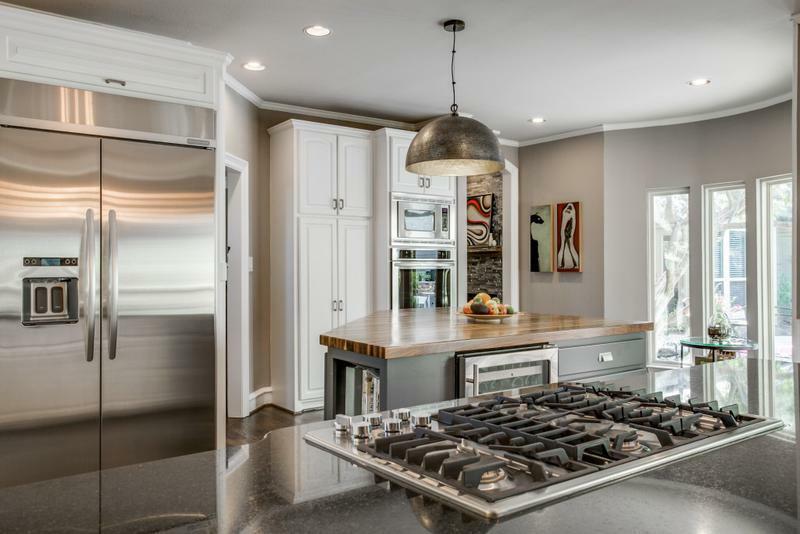 Concrete is one of the few countertop materials that can actually improve with age. There is more use for wood than just cutting boards. This natural material brings warmth into the entire kitchen. Wooden countertops can be weaved into numerous design concepts. You can have the wood as a feature and seal it, or use it as a giant butcher block cutting board for prep purposes. Click here to see a recent renovation that included a custom butcher block island. Resistant to heat, scratches, and spills, it’s no wonder that quartz is still a popular choice in countertops. Quartz is durable and won’t crack and chip as easily as granite. This non-porous material cleans well, comes in a variety of colors, and looks magnificent in any kitchen. A thin countertop is a subtle element that leaves a big impression. Thin countertops create a sleek look that makes it ideal for a modern design theme. Since a thin countertop also makes the kitchen feel larger, it can be a good choice for smaller kitchens. People are always looking for ways to get more storage without compromising the living space in their home. Having elements in your kitchen that serve more than one purpose can save both space and time. Start by adding dining space into your kitchen island. This can add overflow seating, casual dining, and a great place for getting some work done. One of our top remodels of 2015 included both custom storage and room for extra seating. Click here to see photos. Want an easier clean in the kitchen? Of course you do. Integrated countertops are counters with no overhang. This makes cleaning your countertops a breeze, and works best with thin countertops. Saving space is always trending in kitchen design. Retractable vent hoods can be built right into the countertop making them invisible when not in use. This feature can be one of the wow factors of your kitchen; aside from all of the delicious foods. This striking choice in countertops helps your kitchen to stand apart from the others. Since copper is an anti-microbial material, all germs and bacteria should be killed within two hours after contact. Copper rarely stains, is water resistant, and easy to clean. Stainless steel isn’t only reserved for your kitchen appliances. This material is very resilient and durable, and the reflections of the steel can help your kitchen appear larger than it is. Start 2016 off with a plan for your new kitchen! Click here to request an estimate or call us at 972-377-7600.